Turnovers a Factor in Amerks 3-2 Loss to the Bulldogs · Let's Go Amerks! The Amerks have played two games this weekend and so far they’ve lost to one of the better teams in the conference and now the worst team in the conference. The Bulldogs got their first win in seven games on Saturday against the Amerks, one of the only teams in the league that they can seem to beat. Joonas Nattinen scored an unassisted goal thanks to a Drew Schiestel turnover halfway through the third period to score the game winning goal as the Hamilton Bulldog went on to win the game 3-2. The Amerks got on the scoreboard first thanks to a great pass from Mark Voakes to Alex Biega from the bottom of one face off circle across ice to the top of the other face off circle where Biega was able to put a shot on Bulldogs goalie Nathan Lawson. The rebound went to the side of the in a spot that Derek Whitmore was occupying and he put in the rebound. The Bulldogs tied the game 1-1 at 18:46 of the first period courtesy of a turnover by Corey Fienhage. Fienhage had the puck behind the Amerks net and was trying to clear the puck around the boards to Mark Voakes but Gabriel Dumont of the Bulldogs was right on him to intercept the pass. Dumont passed the puck to the front of the net where it went off of Drew Schiestels stick and onto the stick of Mike Blunden who sniped the puck glove side top shelf past Drew MacIntyre. As the puck was intercepted Drew Schiestel and Evan Rankin were rushing to get into position but the bounce of the puck didn’t go there way. Mark Mitera put the Bulldogs up 2-1 with only three seconds left in the first period. Brian Willsie took a slap shot from the top of the face off circle and as the play was focused to the right of MacIntyre the rebound went in an odd direction to the left where Mark Mitera skated in untouched to bury the rebound. MacIntyre had little chance as he sprawled across the crease on his knees. Amerks Captain Colin Stuart tied the game 2-2 at 15:17 of the second period courtesy of Evan Rankin and Mark Voakes. Voakes had brought the puck across the blue line and gave a short back handed pass to Evan Rankin who was skating into the zone with Colin Stuart. The puck was in tight on Rankin but he still pulled off a pass over to Stuart who stopped the pass with his skates, put the puck on his stick and then beat Bulldogs goaltender Nathan Lawson. The game winning goal was due to another bad turnover behind the Amerks net, this time by Drew Schiestel. Schiestel had the puck picked off of his stick again the Amerks by Joonas Nattinen who then wrapped the puck around the front of the net and beat MacIntyre through the five hole. MacIntyre had just made a save and the puck went behind the net. MacIntyre should’ve been a little more prepared in the net not knowing who had possession of the puck but Schiestel also should’ve stayed along the boards but instead was trying to break out near the net which gave Nattinen the easy pick. One of those “what if” games but obviously two bad mistakes were costly. If those turnovers wouldn’t have happened could the Amerks have held on to a 2-1 lead and won? Could they have scored more goals? We’ll never know. In the end they lost again to one of the worst teams in the league in terms of the standings. The Bulldogs only have seven wins this season, four of those are against the Amerks. These are the types of games that can come back to haunt a team late in the season. 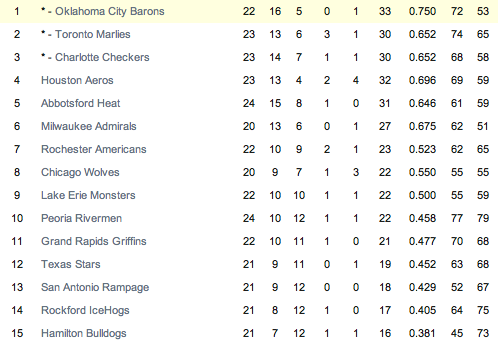 The Amerks are barely holding on to 7th place in the Western Conference with 23 points. There’s three other teams within one point of them and a fourth team within two points. No, the playoffs aren’t determined in early December but it shows how quickly they can drop in the standings. The players missing that have been called up to the Buffalo Sabres are definitely causing an issue, especially on defense. They are without three of their top defensemen which is the biggest issue. Not having Joe Finley, Brayden McNabb and TJ Brennan who is out with an “illness” are sorely missed. The Amerks are off to Albany for a 4pm game against the Devils to finish of their first of three sets of three in three game weekends, all of which include a decent amount of travel. The bad news is that it’s reported that Paul Gaustad missed the third period of the Buffalo Sabres game due to an upper body injury which could mean another player called up from the Amerks. 1st Period-1, Rochester, Whitmore 11 (Biega, Voakes), 4:47. 2, Hamilton, Blunden 2 (Dumont), 18:46. 3, Hamilton, Mitera 1 (DeSimone, Willsie), 19:57. Penalties-Mitera Ham (interference), 2:42; Dumont Ham (goaltender interference), 15:29. 2nd Period-4, Rochester, Stuart 8 (Rankin, Voakes), 15:17. Penalties-Fast Ham (slashing), 1:49; Willsie Ham (roughing), 2:44; Foligno Rch (fighting), 10:09; Schultz Ham (fighting), 10:09; Szczechura Rch (hooking), 10:44. 3rd Period-5, Hamilton, Nattinen 2 9:16. Penalties-Varone Rch (unsportsmanlike conduct), 14:05. 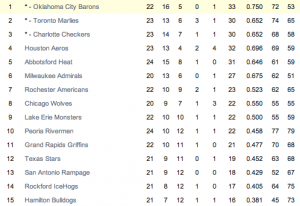 Shots on Goal-Rochester 6-14-5-25. Hamilton 7-13-8-28. Power Play Opportunities-Rochester 0 / 4; Hamilton 0 / 2. Goalies-Rochester, MacIntyre 3-5-1 (28 shots-25 saves). Hamilton, Lawson 6-7-1 (25 shots-23 saves). Linesmen-Kevin Hastings (61), Jesse Wilmot (19).